Reactions to this incredible situation are variegated and, to the cultural anthropologist concerned with ideological change, highly fascinating; and they are far more complex than the Canadians’ effusions. Less than a year ago--over a decade after the publication of The Third Eye, a colleague of mine, a historian with perfectly respectable academic credentials, visited and told me about the wisdom of Rampa, with glowing eyes. When I told him the facts in straight, brief words, he was visibly shaken, but said something like: okay, maybe the man is not Tibetan, but he grasps the truths of Buddhism. He does nothing of the sort, I said and proved,--but I did not convince the man. He (the historian friend of mine) had gone into Raulfing, Macrodier, Yin and Yang, Hatha Yoga, and half a dozen of other things eminently available in America. To him, the question of genuineness or spuriousness did not pose any problem, and I have a strong hunch that his blurring of the possible distinctness between the genuine and the spurious is very much part of the total pattern of eclectic attraction to the esoteric. Hoskins moved to Toronto and founded an ashram-like place with a medium-large following up to date. 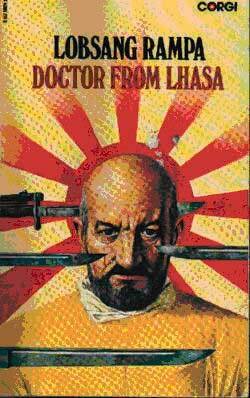 This is in the way of things on the lunatic fringe: but astoundingly, he wrote sequels of at least three more books after the exposure of The Third Eye, starting with Doctor in Chungking. All of these have been out in paperback for years, and they are visible on all sorts of shelves--bookstores of course, drugstores, airports, even Greyhound bus stations...Since publishers are no charitable organizations, this means that the books sell, in great numbers. Saying what I say about Lobsang Rampa, and mutatis mutandis about most other pseud-Asian cults in the Western world, I have, of course, made many more enemies than friends. People simply cannot stand the idea that there is no abominable snowman, that there is no white brotherhood somewhere in the Himalayas, and that people do not fly through the air except in planes; least of all can they suffer the idea that religious specialists in Tibet are scholars, tough theologians, and down-to-earth monastic leaders, with lots of hard political know-how, and with the measure of cruelty and strategy that seems to be common to all ecclesiastic leaders who also have secular powers; and this, of course, was very much the case in Tibet before the Chinese take-over. But matters go deeper than that. We have to investigate the extreme dislike of hard theological, scriptural, commentatorial argument, a dislike that characterizes all followers of the neo-Hindu-Buddhist, and the pseudo-Asian movements of a millennial type. In the first place, anti-scholasticism is one of the hallmarks of millenarian movements at any time. Since Tibetan Buddhism is something very different from millenarianism, I do not discount the possibility that the more highly esoteric churches like the Nyingmapa, Karmapa, and the minor groups might have been classifiable as millenarian at the time of their inception, not on the top echelon of their scholarly leadership, but more probably in its populistic parameters. But for the last hundred years or more, Tibetan Buddhism, even in its most highly esoteric forms as in the Nyingma, has been very much an ecclesiastical, establishmentarian affair. At this time, there are roughly three hundred institutions in North America which claim a Hindu or Buddhist or, to a lesser extent, a Taoist background. Numerically, the Buddhist reference prevails; this is natural, since it includes Indian, Chinese, Japanese, and Tibetan sources, or alleged sources. The guru business is good business, and this has been shown in some recent writings. But this does not detract from the fact that Buddhism, Hinduism, and the other Genuine traditions of the East are misrepresented, and that an image from Tibet is created, and perpetuated, which cannot but be harmful to the future interface between Tibetan culture and the West. It is to these misrepresentations which I now turn, in my concluding assessment. The first and foremost problem, oddly enough, has a very simple answer. How can the millions of intellectually inert, but good-willed seekers after the mysterious East be informed about the actual traditions of Buddhism, about the actual Tibet? The Answer is that the reading agents--libraries, booksellers, and publishers--have to put in some additional effort to market authentic works on these topics, along with the Rampaesque trash.